I made this animated gif on the plane ride back from a conference last year. Someone had it in a talk I saw and I couldn't find a version of it online, so I had to make my own. I need to re-make it with proper resolution, as it looks grainy and ugly. 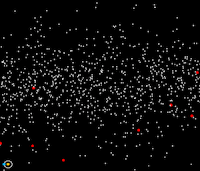 Still, it nicely demonstrates how parallax works in astronomy. You know the stars that move left/right the most are close. 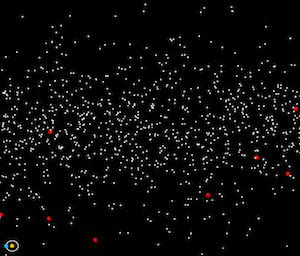 The stationary red circles are my "very distant background quasars". In the bottom left corner you see a representation of the Earth (blue) going around the Sun (yellow). UPDATE: it's 2018 now (holy smokes, almost 6 years later...) and I re-discovered this GIF on my computer. Bonus: sometime in 2014 I actually did re-render it with better resolution. Also the code is now public. Enjoy! You get the same kind of effect by blinking your eyes back and forth, or moving your head in a circle. Or are you asking how I did this computationally?